Juniors 100 – What a great year! It’s been fantastic to see so much going on throughout what has been a great year of celebration. 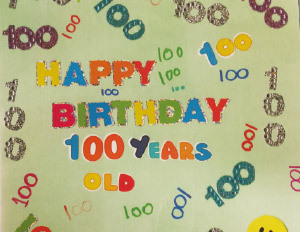 We hope that your Company managed to get involved in the celebrations in one way or another whether it was through the Juniors 100 Challenge, holding a BIG 100 Birthday Party or taking part in a special Juniors 100 event at a Company, Battalion, District or Regional level. We’ve heard stories of how the Juniors 100 Challenge has been a great addition to the weekly programme and we know it has certainly encouraged Companies to try something new. 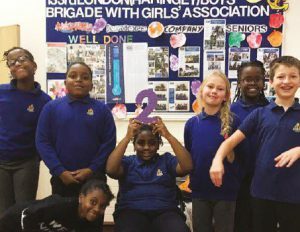 Congratulations go to members of 133rd London Company who were the first section to complete the Juniors 100 Challenge. 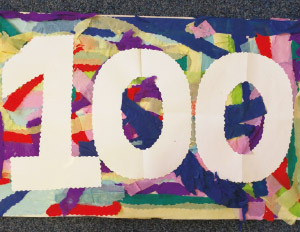 The boys and girls took on the Juniors 100 Challenge and completed all 100 challenges it in the middle of November, a good six weeks before the end of the year. As part of the challenge they completed challenges including ‘Taking part in a world record attempt’, ‘Learning basic first aid skills’, ‘Raising £100 for a local charity’ and ‘Trying-out a new sport’. For several of the challenges, the Company partnered up with members of the 2nd Haringey Company. Well done to all those that sent in a Birthday Card to BB Headquarters (as part of challenge #27). It is great to see the creativity and messages from young people across the Brigade.